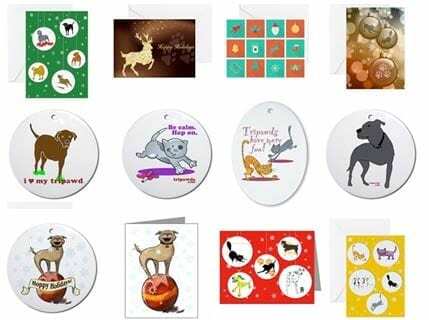 Looking for the perfect gifts for friends, family and loved ones with a three legged dog or cat in their life? Look no further! Show you’ve put some thought and care into your gift giving and support the Tripawds community while your at it. 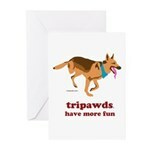 All these unique gifts are ideal for tripawd lovers, and proceeds help keep Tripawds online. 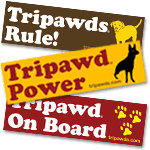 Visit the Tripawds Gift Shop to find fun t-shirts, sweatshirts and hoodies or other apparel featuring favorite three legged dog and cat designs. Browse all designs here, and choose from mugs and glassware, stickers, caps, aprons, cards, blank journals and much more! Sending out holiday cards and thank you notes? Want a special ornament this year? 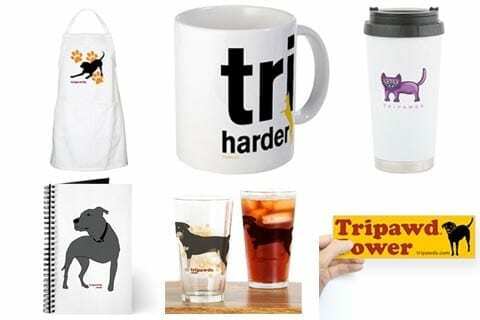 Select from various tripawd-inspired designs. Visit the Hoppy Holidays section for all ornaments and cards! Want something very special for that special person in your life? 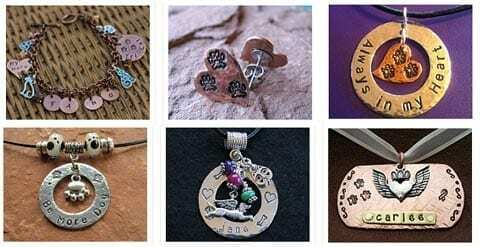 Find personalized pet tags, pendant necklaces, bracelets, urn charms and more in the Tripawds Etsy Store. Be sure to place your order for before December 15 to ensure Christmas delivery! 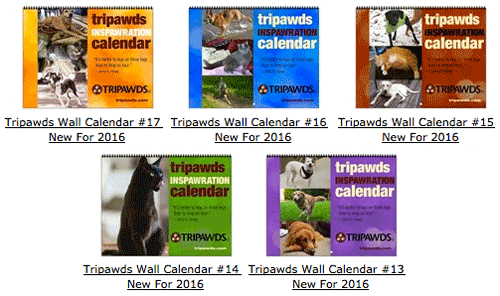 All Tripawds Etsy Store Purchases Before 12/15/15! 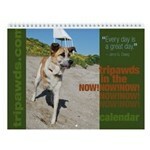 Tripawds calendars make great thank you gifts for your vet’s office, cancer clinic, rehab clinic, or anyone who loves Tripawds! 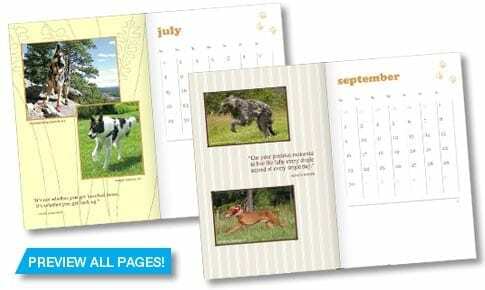 More than a dozen wall calendars feature inspirational three legged dogs and cats with new inspirational quotes every month. See who is in each calendar for the new 2016 designs. 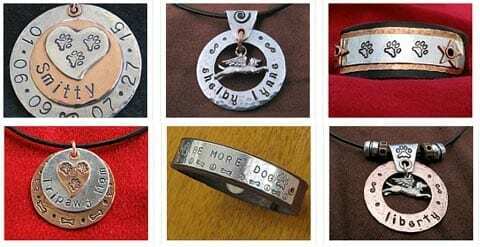 Want to give a truly one of a kind unexpected gift to your Tripawds Pals? Consider sending a copy of Tripawds Heroes. Perfect for any vet’s lobby, this book features the photos and stories of inspirational three legged dogs. Available in two sizes with hard or soft cover editions. 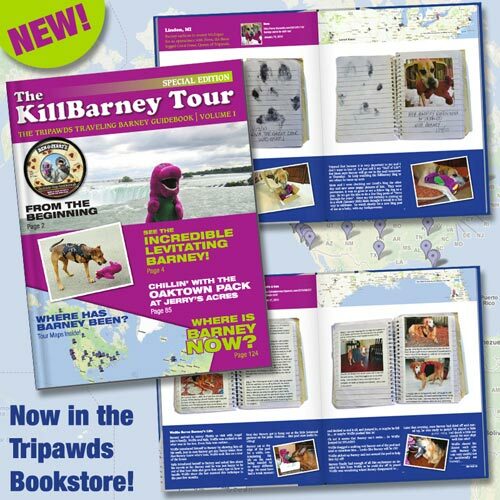 The KillBarney Tour makes a truly unique gift for True Tripawds Fans! This 128 page magazine style guidebook features photos, blog entries, and the original hand-written notes from the first 32 members who hosted the Tripawds Traveling Barney Tour. Help your friends and family live in the Now with a blank weekly planner featuring inspirational three leegd dogs and famous quotes inspiring us to be present. Now planners include monthly and weekly grids that can be filled in with dates for the current year. They are a great way keep progress notes and keep track of appointments, medications, and milestones. Give the gift of information! Looking for a last minute thoughtful gift? Purchase the Tripawds E-books Library and forward the download link. Or, just send us a note upon checkout with the Tripawds username or name and email address of the person you want to receive the book. We will forward the link for downloading the e-books along with a personal note within 24 hours. Tripawds Library is two helpful e-books in one! Tripawds e-books are packed with helpful information for recovery and ongoing care. With all your holiday shopping, please remember to start here when searching amazon.com to help support your Tripawds community! Start Your Amazon Search Here! Use the search box above to find deals on anything, or visit this link when shopping at Amazon.